This historic British fort, built in 1796, was a key defense post during the War of 1812 between Britain and the US . It has been restored to the period with replica buildings and costumed staff. Those looking for a different kind of thrill at the falls can test their skill and luck at 3,000 slot machines and more than 100 gaming tables. A large monument pays tribute to General Brock, a leader of the British forces killed in battle here during the War of 1812 . With great views of Niagara River, the park is a fine picnic spot. Don’t miss the awe-inspiring Niagara: Miracles, Myths and Magic, chronicling the history of the falls. Projected onto a giant screen, the movie, thanks to a special filming technique, makes you feel like you’re right in the midst of things. Original stunt barrels are displayed in the theater’s Daredevil Gallery. Its viewing deck affording vistas of as far as 80 miles (130 km), this tower rises 775 ft (236 m) above the falls. Fine dining at the revolving restaurant. Linking Lakes Ontario and Erie, this eight-lock, 27-mile (43-km) canal first opened in 1829, allowing vessels to traverse the Niagara Escarpment – and the 328 ft (100 m) height difference between the lakes. 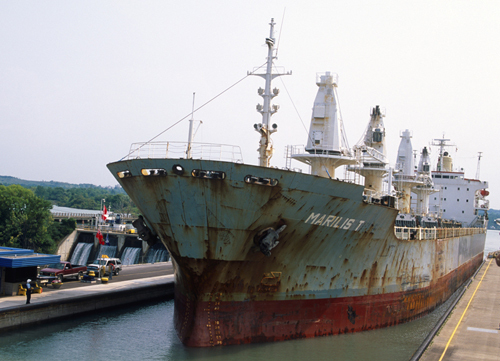 The canalside trail from Thorold to St. Catharines is great for ship-gazing. This is Niagara Fall’s shopping and entertainment district: museums, mini-golf, and midway are just the start. Hotels and restaurants for every budget are also to be found here. Experience some 10 minutes of exhilaration as you swoop over whirlpool rapids, then get up close to the falls. This reconstructed fort, a supply base for British troops in the 1700s, was the site of many battles with US forces in the 1800s. Killer whales and arctic belugas aren’t the only attractions at this theme park, though to many they are the highlight. Walruses and sea lions also make appearances in the marine animal shows; habitats harbor bear, elk, and deer. Adventurers can hop on the 10-plus rides, including the world’s largest looping roller coaster and the only one with a bowtie inversion. For some 200 years, daredevils have risked their lives at Niagara Falls for a chance at fame. Nineteen have died; many others have had close calls. The first daredevil, Sam Patch, dove headfirst from an 85-ft (26-m) -high platform into the churning Niagara River, in 1829, and survived. Ten days later he did it again, from a height of 130 ft (40 m). 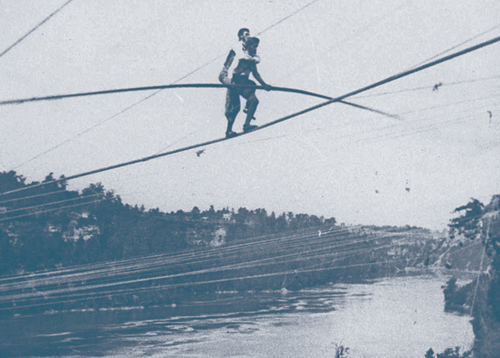 The Great Blondin couldn’t get enough of the falls, crossing the gorge on a tightrope nine times in 1859 – once carrying his manager. When Blondin returned in 1860 for more stunts, such as pushing a wheelbarrow across the rope, he was challenged by a young upstart, The Great Farini, who crossed carrying a washing machine. Farini performed biweekly, becoming increasingly daring – doing headstands, hanging by his toes. He survived them all and died at age 91. The first woman funambulist, Maria Spelterini, also crossed blindfolded, in 1876. The first person to survive going over the falls in a barrel was Annie Taylor, in 1901. Emerging from her battered vessel, the 63-year-old schoolteacher said, “Nobody ought ever do that again,” advice dozens have since ignored.